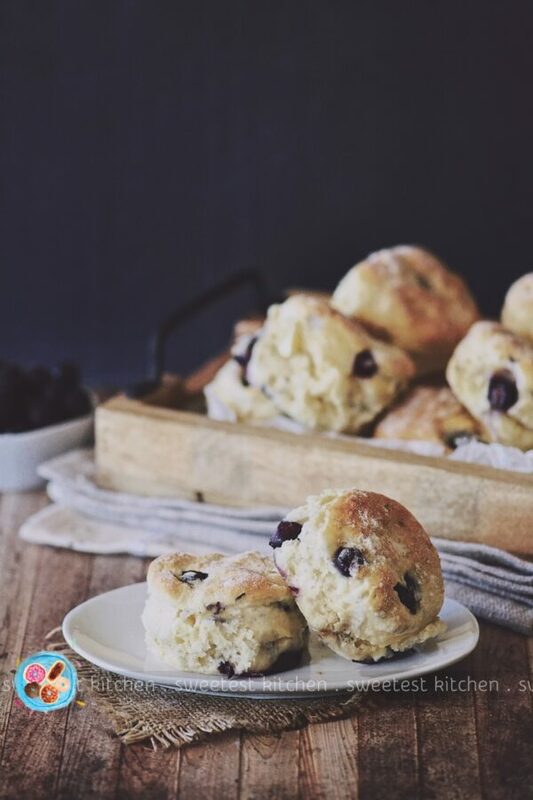 These easy Blueberry & White Chocolate Ginger Beer Scones are the perfect delicious twist to the traditional scone recipe, and best of all – they’re just about fool-proof! Wow, you guys… I did something amazing the other week – I applied for a job! Like, a REAL job! That’s something I haven’t done in about 14 years!? It was only a sales assistant position at a local retail shop, but it’s a shop I feel really passionate about and I thought my cover letter and resume conveyed that really well… however, I was rejected, and I had a little self-pity moment… then I decided that I’d try again later. And in the meantime, I’m going to try to bring my foodblog back to life! Hah! Running a foodblog is pretty hard work, believe it or not. Sure, you get to have fun researching recipes and making food and styling photos, but writing the content and getting people to visit your blog is the hardest. In my year-long hiatus, Sweetest Kitchen lost a lot of visitors and I felt really, really bad about that. I’m aiming to get those visitors back, and hopefully a few more, too! Anyway. 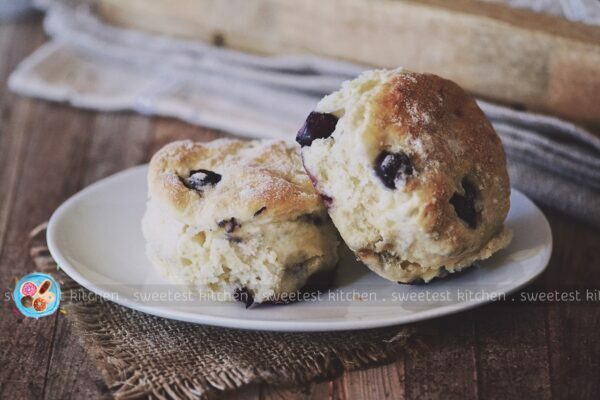 Scones. 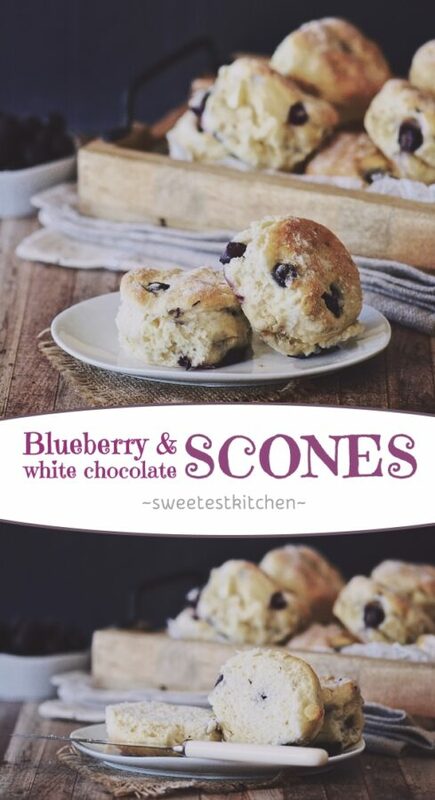 You all love scones, right? They’re a bit different in the US, though; they’re sliced into wedges, are a bit dense, I think, and often have some sort of drizzle of something on top. But in Australia, they look more like a US-style biscuit that you’d have with dinner… but in Australia, biscuits are cookies… oh dear, this is getting really confusing! Let’s start over. 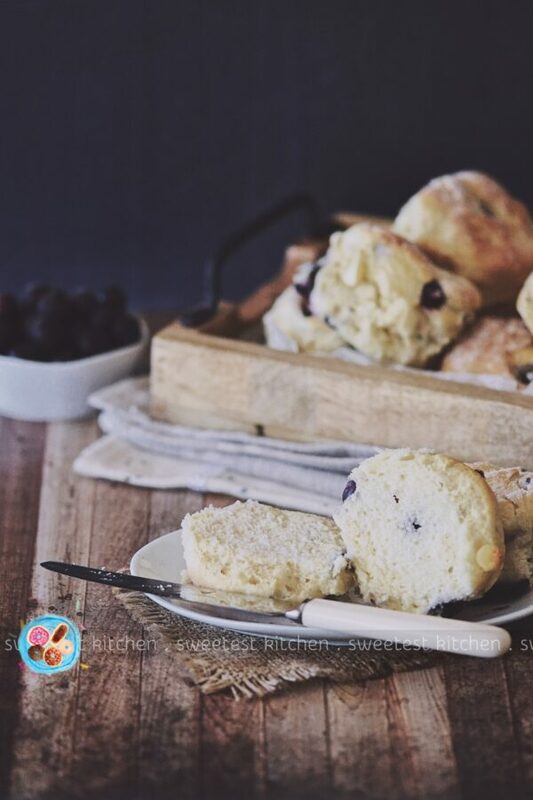 I made some Blueberry & White Chocolate Ginger Beer Scones the other day and they were absolutely fabulous and beautiful! 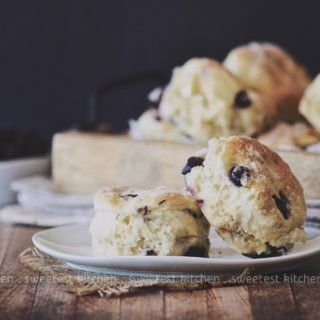 This basic recipe for scones is my go-to favorite and is just about fool-proof (as long as you’re not heavy with the mixing, kneading and baking!). I can’t wait to tell you more about it! To start with, you need just four ingredients – self-raising flour, a pinch of salt, thickened cream and ginger beer. The process is super simple. You begin by sifting the flour and the salt into a big bowl. Make a well in the center. Add the thickened cream and ginger beer. Stir with a butter knife JUST until it starts to come together; some flour bits will still be visible (if you’re adding mix-ins, like blueberries and white chocolate, gently stir them in at this point). Then scrape the dough onto a lightly floured surface and knead a few times until smooth. Pat it into a circle-shape about 1.5 inches (about 4cm) thick. Cut out circles with a 2-inch (5cm) cutter – oh, here’s a tip, when cutting out circles, do NOT twist the cutter. Just push down and pull up without twisting, otherwise the scones may not rise as high as they should (yeah, it’s weird, but true!). 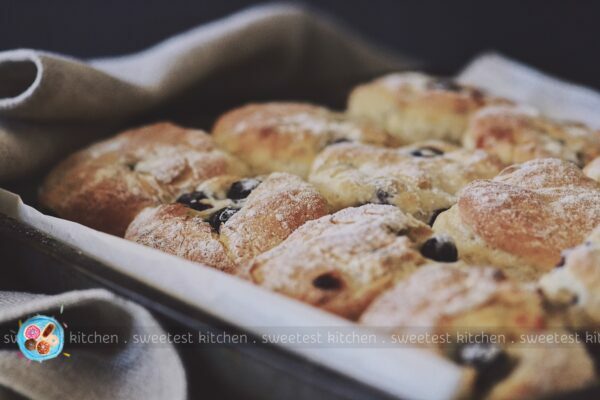 Place the scones on a baking tray and bake for 15 minutes. Done. 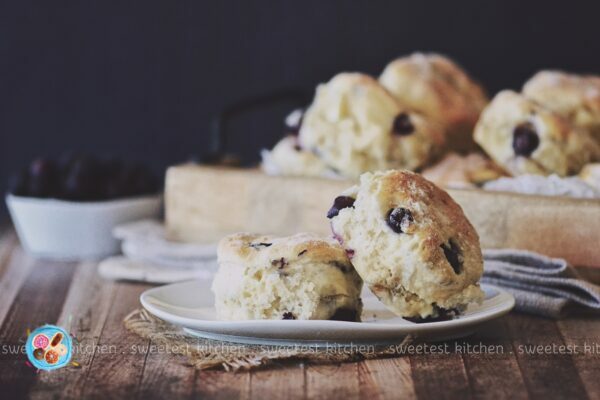 If you’ve ever made traditional scones before, you’ll know that you need to work in little chunks of butter and you’ve gotta do it just right so you won’t end up with little scone-rocks. You don’t need to worry about that with this recipe, yay! I haven’t yet messed up this recipe, and I’ve made it several times, which is why I’ve said it’s basically fool-proof. You can add whatever you’d like to this recipe; if you don’t like blueberries or white chocolate, leave them out and add raspberries. Or add some tiny pieces of candied ginger, which is my absolute favorite addition to this basic scone recipe. Of course, you can leave out any mix-ins altogether and enjoy them plain, or with jam and cream. These gorgeous scones come out of the oven with a lovely golden top and a soft and fluffy interior. Completely irresistible! 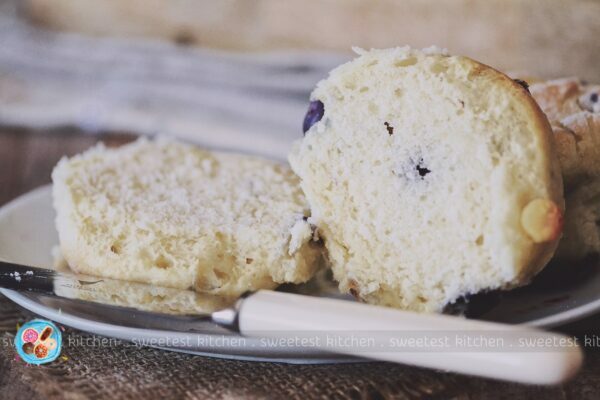 These Blueberry & White Chocolate Ginger Beer Scones taste best on the day they’re made, but they will stay soft and delicious for 1-2 days afterwards. I guarantee they won’t be hanging around that long, though! 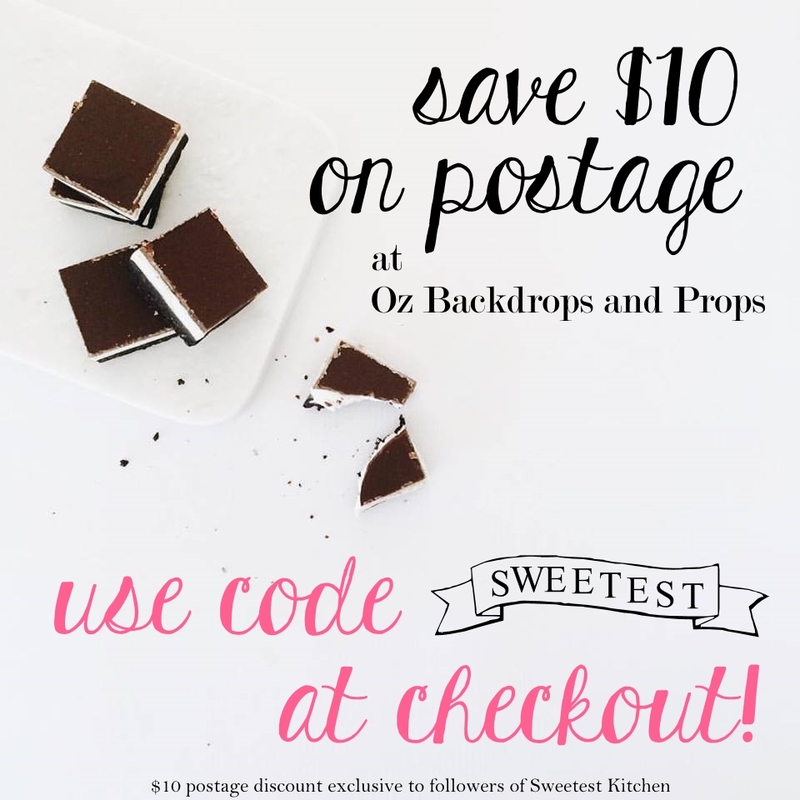 Another tip – they’re awesome for after-school snacks! My kids love them! Without any futher ado, because I know you’re excited to get started on these, here is the recipe! Enjoy! 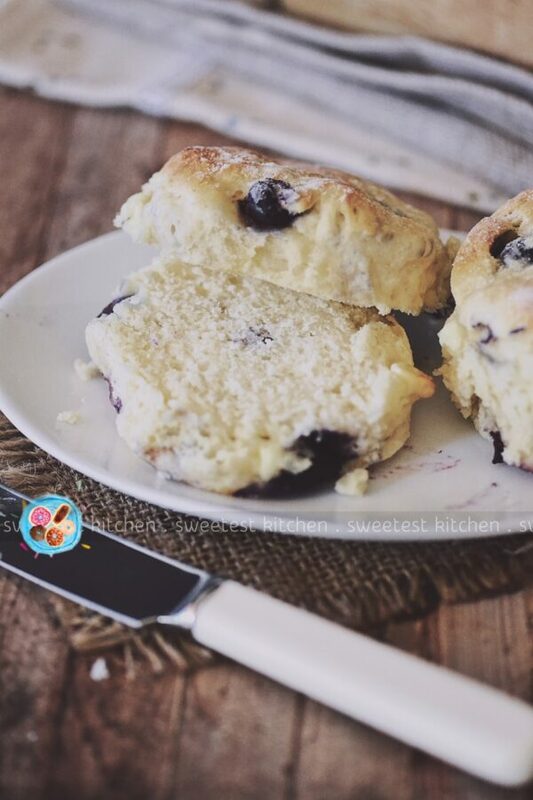 These easy Blueberry & White Chocolate Ginger Beer Scones are the perfect delicious twist to the traditional scone recipe, and best of all - they're just about fool-proof! Preheat oven to 200C. Line a baking tray with baking paper and set aside. Sift flour and salt into a large bowl. Make a well in the center and pour in the thickened cream and ginger beer. Stir with a butter knife just until the mixture starts to come together; some floury bits are fine. Add the white chocolate chips and blueberries and gently stir them through just until they're evenly distributed. Note that the mixture will be a bit sticky. Scrape dough out onto a lightly-floured surface, flour up your hands and knead gently a few times just until dough is smooth and no longer sticky on the outside. Pat dough out into a circle about 2cm thick. Cut out rounds with a 5cm cutter - do not twist the cutter or the scones won't rise as high. Just push the cutter straight down and then pull straight up. You can re-pat the dough into a circle again to cut out more scones, but the tops won't be quite as smooth as the first round. Arrange the scones, slightly touching one another, on the prepared baking tray and bake for 10-15 minutes or until golden. 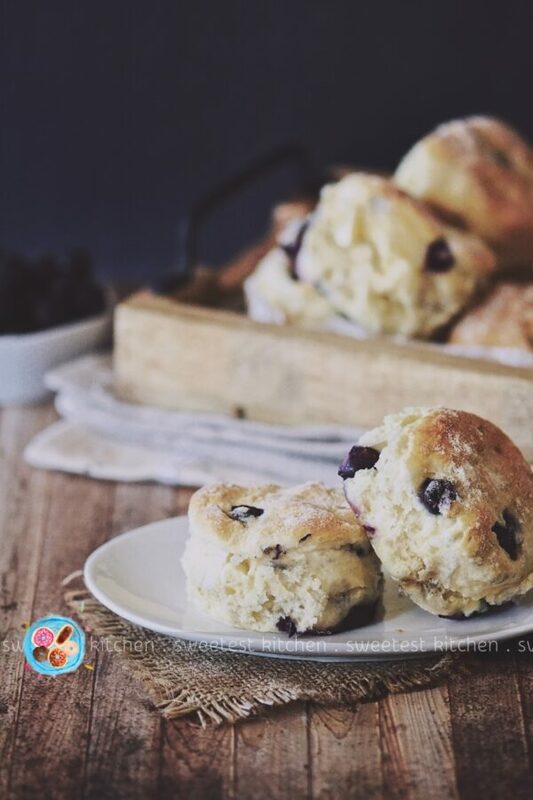 If using frozen blueberries, leave the blueberries in the freezer until you are ready to mix them in, otherwise they will turn the scones blue-ish/purple-ish, and be sure to stir and knead extra gently so you won't squash them and release the juices! Previous Post: « Easy Churros For Cheaters!